I can't remember how November started but it ended with a dash to the FACTOR office to submit a grant application to make a demo. I didn't have the distribution, so I couldn't apply for the whole enchilada but it'll be interesting to see if I even get enough to cut a few more tunes. The FACTOR office was buzzing with activity, there wasn't any flat surface that wasn't occupied by someone frantically filling out forms. A couple of guys were holding their forms up against the wall and filling them in. As I drove up to front I saw drummer/entrepreneur Graeme Kirkland waved as he drove off. Inside, I was greeted by Kim, who recognized me and said "Hey, five minutes to spare!" We'll see how that works out. I feel like I've already won because for the first time, I actually filled out the form and delivered it. Yes, of all the grant applications I have begun, this is they only one I ever delivered. I always maintained that these funding agencies deliberately set up a gauntlet of obstacles to eliminate those who are not "serious enough" about their career. Well, I've never been accused of being "serious enough" - that's for sure! What else can I share for the few curious souls who are following my trials and tribulations (yes, people do tell me that they visited the site and enjoyed my ramblings): I got a little advance press for my gig at the Montreal Bistro - I was a "pick" in the Toronto Star and I know of at least one person who came to the show because he saw it there - and that was my dentist! It was tough getting people out on election night - next time I play the Bistro, it'll be in September! The gig i played opening for the phenomenal Michael Jerome Browne at the Now Lounge was also very low attendance - and he is one of the leading lights in Canadian roots music right now, with a successful album, management, etc. But still, it's tough getting people out - when I sent out a gig notice I was starting to write something like let's give him a big "Toronto Welcome" - then I realized that's a bit of an oxymoron. I was the opening act (in Quebec they used to call this the "vedette Americaine" because every big Quebec star would bring in an american artist to open and give the show some extra pizzaz). I hope I didn't get too silly at that gig, but there were just a few people and I had this new blues riff that I had just learned - "Lookin Good" by Magic Sam - and I think I played it between just about every song I did and even broke into it in the middle of another song...yikes. But I was soooo excited to be able to play this groove. I had recorded this tune off the radio 20 or 30 years ago, never knew who the artist was, never heard it again, but listened to it over and over again over the years. When I finally saw Rockin' Johnny from Chicago playing it close up, I saw how it is played (I always thought it was two guitarists on the record). You can read more about the Magic Sam connection below. There was a great discussion about blues jams lately, and I followed it with great interest. In fact I had some great support and advice (all very different) from some very experienced jam hosts, Danny Marks, Jim Krueger, John Dickie and Steven C. I needen't have bothered because the first thing the club owner said to me was "Whatever you do, don't let anybody on this stage unless you know them or somebody vouches for them - we've had to literally drag people off this stage and out the door." Well, that settles that! I guess we'll be thinking of my jam as kind of an "invitational" and I don't apologize for making it a bit of a showcase for myself, since it's the only regular gig I have. We had a some great guests last time including Zoe Chilco, the proud mom of a new CD, Mbodeo, hot off the press - and even though it wasn't a big audience, she had the opportunity to make an impression on some music industry taste-makers including Dave "the Man from Socan" Betts and at least one record producer/label owner. This week I've been following the recent "surreal gig" discussion on the "maplepost" list, just last week I had a gig that bassmeister Terry Wilkins claimed was quite surreal. 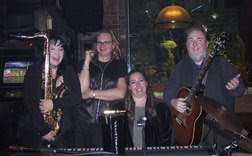 We were playing (with Carrie Chesnutt on sax) at the Bay on Yonge Street, Toronto - to celebrate the kick-off of their extended shopping hours for the holidays. Several bands were playing throughout the store, a big band on the main floor with a stage and PA. We were on the third floor, set up by an escalator in the "Jeunesse" department. All of a sudden, a marching band in baby blue uniforms with fuzzy hats comes down the aisle and Terry starts playing along with them and attracts them to our "station" and prettty soon we're all jamming on "Here Comes Santa Claus" or something like that. If that wasn't surreal enough, there was an elderly gentleman standing off to the side listening intently and Terry leaned over to me and said "that's Roland Mitchener!" I said "I think Roland Mitchener is dead," but a minute later when the gent said something, Terry asked if he was Roland Mitchener. He replied "I'm Mitchell Sharp." Terry said "well at least I got the "mitch" part, and they had a good laugh and we chatted about music (he plays piano every day) and he was in the official party that travelled to Europe and Israel with the National Arts Centre orchestra. Tonight I intended to stay home to work on the December MapleBlues and send out this email notification - maybe make a few phone calls to get people out on Monday, but I got a call from Lily Sazz, my piano player, asking me to bring a couple of mike cables up to the Black Swan where she's playing with Blue Room. Paul Sanderson, the leader, never ceases to amaze me with all the duties that he fulfills in that band. Paul, if you didn't know, is Canada's foremost music attorney and has a thriving practice and it would be easy for him to play it safe but practically every song had a worked out guitar intro and was propelled by his solild rhythm. Lily fit right in with the piano. From the Swan, I made my way to the Montreal Bistro to deliver some promo for my gig Monday and heard the last set of Bill Mays with Neil Swainson and Terry Clarke. I don't think the jazz piano trio could get any better than these three world-class players. The music was phenomenal and it was confirmed that there were many jazz pianists in the house watching in rapt attention and when Mays stuck his left arm in the piano to mute the strings, three youn men all got up from their seats to get a closer view of how he was doing it. It sounded very much like a guitar player who mutes his strings with the ball of his hand. Then he played a ballad called "The Peacocks" by Jimmy Rowles, whom he said "holds the world's record for 'hanging out' the longest at Bradley's in New York City. They played the gig from 9:45 to 3:00am, carried on until 5pm the next day, went home an showered - possbly - then came back and played the first set at 9:45 the next day. Day in and day out." Then, since I was out and about, I swung by the Silver Dollar to catch the last of Eddie Shaw and the Wolf Gang. To come from a couple of Neil Swainson bass solos to hear a pretty primitive bass solo by Eddie's long time bass player, Shorty, who is quite short and plays his Fender bass sitting on the edge of a straight back chair with the bass hanging practically to his knees. Eddie's son Vaan was being interviewed for a video documentary in the dressing room and had some very perceptive observations about guitar players, and in particular young white blues guitar players. He said Stevie Ray Vaughan and Kim Wilson were the blackest white men he'd ever met - that they had totally absorbed the culture. And while he decried that the musicians who planted the seeds never got to benefit very much financially, he certainly gave the white blues players their due. Roy Buchannan is one person that could really play the blues. When the interviewer asked for a seminal blues song or album, Vaan said "I'll do better than that. I'll give you the name - Magic Sam. He had it all, and the greatest thing is ...he didn't know it. He was a simple man with no formal education. Interesting that he should mention Magic Sam. In the last few days I've heard two guitarists playing at the Silver Dollar, Tony D from Ottawa and Rockin' Johnny from Chicago and both of them pulled out the classic Magic Sam instrumental, "Lookin' Good" as a "barn-burner" guitar showcase. It's one of my favourite blues instrumentals and for years I had a recording off the radio but I never learned till recently the it was Magic Sam and it wasn't until I saw Rockin' Johnny playing it close up - til then I thought there were two guitars making that incredible rhythm. Even though practicing is an alien concept to me I have been playing that guitar part over and over for the last 3 or 4 days. I haven't been this focused since I spent a week-end with a Danny Gatton video, probably the only time I put any real effort into learning a guitar riff. I can't say I've made any great effort to learn other people's styles ever since my introduction to the blues from an instructional record called "The Art of the Folk Blues Guitar." That was 35 years ago and I'm still playing some of those songs, and the same seven or eight licks...on the same guitar! Tip of the day: A couple of musicians have suggested lately that the simplest and maybe cheapest upgrade a musician can make to his gear is to get all new cables - premium (broadcast) quality. I'm told the improvement is immediately apparent - more frequency response, presence and probably other difficult-to-measure factors. Hmmm, and I've always bought the cheapest cables I could find and used them for decades! Nov 13, 2000: I've been following with great interest the discussion about blues jams and the role of a jam host because tomorrow night I will be hosting my first blues jam at the Tennesse on Queen St. West (and thereafter every second Tuesday of the month - if I can make a go of it!). I'm calling the jam "Colorblind Brian's 12-Bar Blues Jam" and I'm hoping it will nurture the laid-back country-blues style that I like, but to get it started, I'll be happy for any jammers that show up. This jam has not been publicised at all so I hope some of you Maplebluezers will pack up your axe and bring it to the Tennessee tomorrow (Tues) night. I look forward to jamming with you and perhaps getting a few tips...my limited experience with blues jams in Toronto has been a lot of waiting and very little playing, if at all. Maybe that will make me a more compassionate jam host. Other stuff I've been doing: On Nov 7, I was at a CD launch for the Rob McConnell Tentet, a collection of the best horn players on the planet and recognized globally with Grammy Awards and such. They played a few tunes that demonstrated a real comfort zone that each player had achieved. They were flying! And then we went up to the Silver Dollar to hear Walter "Wolfman" Washington. Every tune was so worked out. Horn shots and lots of little arrangement things. After the show I was talking to him - said that a lot of the musicians in the house were impressed and they must rehearse a lot. Walter said "Well, we've been together 18 years..." (nuff said). There were not one but two tour buses parked outside the Dollar but alas neither of them was for the comfort of the Wolfman. The downstairs club, the Comfort Zone, was featuring a couple of English "jam bands", the Ozric Tentacles and the Star People (I never heard of them either!) I heard a bit of both bands, but it was back upstairs to hear Wolfman. They don't make em' like that anymore!